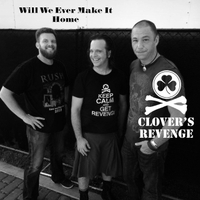 Clover's Revenge plays music called Irish Speed Folk which is Irish music with a punk rock soul performed on acoustic instruments. Influenced by The Pogues and Flogging Molly, Will We Ever Make It Home is a story of the Irish immigrants who are always wandering and never completely at home where they are. They seek community and ownership in a land that is not theirs and yet they stubbornly strive to make it so. The driving beat recalls the punk rhythms of the 80's, but borrows lyrically from other Irish punk bands. Featuring all acoustic performances (guitar, mandolin, cajon), the band can fill a room with electric energy without giving up the precision of unplugged instrumentation.